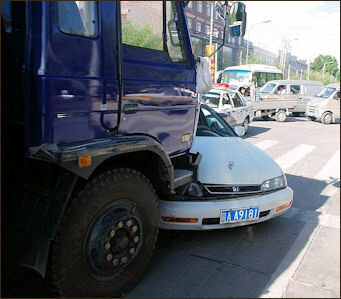 Serious traffic accidents are common in China due to lax driving habits, overloaded vehicles and bad road conditions. According to People’s Daily Online, which cited Public Security Bureau data, there were 210,812 road accidents in China in 2011 involving injury or loss of life. There were at least 62,387 traffic fatalities the same year, with road accidents accounting for more than 80 percent of all accidental deaths in the country. In 2010, more than 65,200 people died in road accidents -- around 178 fatalities a day -- according to official statistics. Zhao Hang, the president of the China Automotive Technology and Research Center, told the New York Times traffic accidents are the single biggest reason people in the Beijing area go to physical rehabilitation centers. Although China has only three percent of the world’s vehicles it accounts for 24 percent of the world’s traffic fatalities. The death rate from accidents is 5.5 times higher in China than in the United States. China has about 85 million passenger cars plying its roads, about 40 percent fewer than in the United States. Yet 67,759 people died in road accidents in China in 2009, according to official statistics---more than twice the number in the U.S. the same year. Chinese drivers are getting better. Statistics for 2009show that 67,759 people died on the road in China, a 7.8 percent decline over the previous year. In 2008, 73,484 people died in road accidents, 304,919 were injured in 265,204 road accidents. Compared to 2007, there 10 percent fewer deaths, 20 percent fewer injuries and 19 percent fewer accidents. Traffic accidents killed 107,000 people, nearly 300 a day, in 2004. A total of 89,455 people were killed in road accidents in 2006, about 245 every day, down 9.4 percent from 2005. Out of the total 76,000 were caused by speeding, drunk driving and other violations. By contrast 48,443 people were killed in traffic accidents in the United States in 2006. A study by the World Health Organization cast serious doubt on the official Chinese figures. Comparing policy data with hospital records, the study concluded that the real death rate from traffic accidents was roughly twice the official figure. Accident statistics in China are derived from police reports and not hospitals or medical clinics. The WHO has said that the figures are probably low and may be only about half the true figure. According to the World Health Organization, some estimates suggest that around 250,000 people die in road accidents every year, which would make it the leading cause of death for people aged 14 to 44. The WHO estimates that traffic accidents cost the Chinese economy $21 billion a year. China has topped the world’s list in traffic fatalities since the late 1980s, when it recorded 50,000 traffic deaths for the first time, and has been increasing steadily since then as the number of vehicles on the roads have soared. In a 1996 survey in traffic death rates, China ranked third behind South Africa and Slovenia.. The number of fatal accidents per car in China is 55 times higher than Japan. In 2003, 104,372 people were killed and 494,174 people were injured on China's roads. There was a decline in the number of fatalities by 13.7 percent and injures by 12.1 percent from 2002. The total number of recorded accidents was 667,507, 13.7 percent fewer than the year before. The decline was attributed to the SARS outbreak, which reduced the amount of traffic on the roads. In 1999, according to police reports, 83,529 people (279 a day) were killed on China's road, a seven percent increase from 1998. The number of accidents increased 19.3 percent from 1998 to 1999 to 412,860. The number injuries rose in the same period 28.4 percent to 286,000. Many accidents involved pedestrians by followed bicycles and motorcycles. Mortality rates for males are more than double that for females. car crashes China's roads are among the world's most dangerous, with traffic and safety laws widely flouted. Drivers looking to maximise profits often load their buses with too many passengers, sometimes triggering deadly incidents. The high numbers of traffic deaths are blamed on the large number of inexperienced drivers, treacherous road conditions, reckless driving, and poor quality of motor vehicles. Almost two thirds of the of traffic fatalities occur on rural roads. Most accidents involve some kind of driver negligence. Alcohol, tired drivers, overloading and speeding are often involved. Reports of trains colliding with cars, hit-and-run accidents and drunk driving are common. Inexperienced drivers are known "benbenzu" (“the unlicenced generation”). In Shanghai they are responsible for about a third of all traffic accidents and deaths. One celebrated case involved a wealthy businessman who had license but never drove because he had a chauffeur. One day he asked his chauffeur if he could drive and confused the brake and gas pedal and drove his Audi A6 into a river and drowned. Others are drivers who have just gotten their licenses. Anxious to hit the roads, they coax friends into lending them their car and then go out and crash it. more car crashes Small accidents are usually negotiated on the spot, with an agreement to pay some agreed amount. An effort is made to avoid involving the police. Crowds often gather around accidents out of curiosity and to ensure justice is served. When a pedestrian is killed by a car the driver faces a maximum liability that varies from about $4,100 in rural Shaanxi to more than $37,000 in Shanghai. When a person is merely injured there is no such cap. These liability rules have created some twisted incentives such as drivers hitting pedestrians and then running over them in an effort to kill them so they can get out of paying hospital and compensation costs. When a large accident occur drivers tend to stay where they are in the middle of the road as they wait for police to sort out blame rather than pulling over to the side of the road. yet more car crashes "Rules, regulations and conditions vary wildly throughout China, but a general rule of thumb is that traffic safety is poor and driving in China can be dangerous," warns the U.S. State Department to travelers planning on motoring there. "Traffic is chaotic and poorly regulated, and right-of-way and other courtesies are usually ignored." A common bumper sticker in China is "Newbie on the road, please excuse me." Someone who drives recklessly is called a ma lu sha shou, meaning "road killer." "These are first-generation car buyers," said Whitney Foard Small, a spokeswoman for Ford Motor Co., which runs free programs in China teaching drivers such basics as when to use a turn signal. "They don't come from a car culture. They don't have Mom and Dad teaching them how to drive courteously and how to be safe." Traffic police have been trying to fill that void. Beijing recently announced a five-year plan to crack down on some of the most common bad driving habits, such as running red lights and failing to stop at zebra crossings. Also targeted: tossing garbage out of the window and needless honking. “Many people just think they drink when they need to drink and they drive when they need to drive. They don’t yet realize those two are in conflict,” said Xia Xueluan, a sociologist at Peking University. “The change in culture in China hasn’t caught up with the growth in cars.” He and other experts say drunken driving is the result of the new China colliding with the old. In just two decades, China has transformed from a land of bicycles to a country where cars are the preeminent symbol of status. China’s healthy love for liquor has been celebrated for centuries. Its history and literature are practically soaked in it---especially the traditional Chinese grain alcohol baijiu. Baijiu remains ubiquitous in restaurants. Business dinners inevitably feature the fiery, sorghum-based liquor, with each side making toasts and forcing the other to drink under threat of losing face. The Chinese appetite for alcohol has only increased in recent decades, according to studies. Baijiu production has shot up by more than 50 percent in the past three years. The marketing firm Datamonitor predicts that Chinese alcohol consumption will rise from 47 billion liters in 2009 to 61 billion liters in 2014. Government censors quickly tried to quash news of the incident, seeing all the ingredients for public backlash. But the case went viral online, and “My father is Li Gang” has become a catchphrase---shorthand for avoiding one’s responsibilities---and the subject of songs, online parodies and even an art installation. When Li’s son was convicted a few months ago for a lesser charge of causing a traffic accident, the blogosphere boiled over with fury. Amid the recent crackdown, those without political connections have fared considerably worse. At least one intoxicated driver has received a death sentence in the past two years (though it was later reduced to life in prison).The arbitrary harshness of a few sentences has some judges and legal experts beginning to question the government’s new approach. In May 2011 “China instituted its first law making drunken driving a criminal act. Soon after, officials declared a full-on war in China’s streets. In Beijing alone, 7,000 police officers were deployed to set up checkpoints, armed with tear gas and 10-meter, tire-puncturing nail strips. And for several weeks, state-owned media plastered stories of such arrests on their front pages. Unused to the idea of moderation, confused drivers in China have responded to the recent crackdown on drunken driving with their own shows of force. One man in the northern province of Shanxi bit the hand of a policeman in an attempt to avoid an alcohol test. An officer in Beijing remains in a coma after being run over last year by a driver he was trying to stop for an alcohol test. 70 kph refers to a hit and run case that preceded the famous my Dad is Li Gang case, in which police in Hangzhou appear to have colluded with a driver’s version of events after a hit-and-run accident. murder sentenced to death In June 2011 a 21-year-old music student named Yao Jiaxin was executed in Xian for a particularly grievous crime: After accidentally hitting a female bicyclist with his car, Yao saw she was still alive, so he stopped, got out and stabbed her eight times to make sure she was dead and could not identify him...The fact that Yao was sentenced to death was not uncommon. At least on the Internet, his crime was widely denounced, with citizens demanding Yao’s death. "Yao, after running into the victim, stabbed the victim's chest, stomach and back several times until she died. His motive was extremely despicable, his actions extremely cruel and the consequences extremely severe," said a statement by the SPC.Although Yao surrendered to police four days after the murder, it was not enough to change the severity of his crime or the sentence, said the SPC. The news of the execution, like the case itself since it was first made public, drew huge attention, and by Tuesday afternoon it had become a top topic on Sina Weibo, the Chinese equivalent of Twitter, with more than a million micro blog posts mentioning the execution.Tens of thousands of people have voiced their thoughts on the case, many expressing anger over Yao's atrocity and asking for justice. After the second trial, an online survey by sina.com.cn with about 40,000 respondents showed that about 67 percent support the death penalty while 13 percent think "Yao should be given a second chance". Yao Qingwei, Yao's father, opened a micro blog after the second trial, posting an apology to Zhang's family and "all Chinese people" for what Yao had done. Yao Qingwei said that Yao Jiaxin had his last wish, hoping his parents will go and visit Zhang's parents and her two-year-old son. "Yao Jiaxin committed an unforgivable crime; his mother and I are filled with anger as well as pain. We sincerely apologize to Zhang's family for the hurt our son had caused," according to Yao Qingwei's micro blog. "Accident videos are almost guaranteed to get millions of views," said Jean Shao, a Youku spokeswoman. "I don't know why. People just love them." More than 13,000 comments were left for the video, most expressing outrage over the reckless behavior. "Too many people don't follow the traffic rules in China," wrote someone using the online handle Tai Fu Le. "But there are too many new drivers as well. They become 'road killers.'" The coach, which overturned on impact, was carrying 55 passengers, most of them college students on their way back to school after a seven-day national holiday. At least 56 people were killed in three major road accidents, including the Tianjin smash, during the one-week holiday break, according to media reports. In December 2010, 21 people died -- including 14 schoolchildren -- and 25 more were injured in three horrific car accidents, one of which involved more than 100 vehicles. On a foggy stretch of highway in Sichuan province 134 cars were involved in a 4-mile pileup. Weeks later, on the same day, 14 schoolchildren in central Hunan province died when their three-wheel vehicle swerved off a road, while seven people died in a 100-car pile-up in southwest Guizhou province. In November 2011, a nine-seat van badly overloaded with 62 kindergartners, along with a teacher and the driver, careened down a foggy street and crashed head-on with a coal truck in Gansu Province in northwest China . The van was demolished, killing 23 passengers (21 children and two adults), and injuring everyone else on board. The China Daily reported: “The bus, with just nine seats, was crammed with 64 people, which obviously contributed to the number of fatalities and the seriousness of the injuries suffered by some of the children. Forty-four of those on board, mostly children, were hospitalized and 10 of them are seriously injured. According to Xinhua the accident occurred in Yulinzi township of Zhengning County. Parents of students at the kindergarten said school bus overloading has been a problem for years, despite repeated complaints. An initial investigation showed that the school bus had its seats removed to make room for more passengers and was speeding in adverse weather conditions. By Thursday, the discussion in China’s blogosphere had turned sharply against the government. A microblog post by local officials in Gansu Province that hailed the swift official response to the disaster was hooted down by critics and was subsequently withdrawn. Commentators asked why countries like the United States had enormous, high-riding school buses instead of shoddily built microvans.The magazine News Weekly posted a rhetorical question on its blog: “Why doesn’t the flower of the nation have a proper flower pot?” and posted next to it a picture of a big yellow school bus. Some were skeptical that the new standards would have much effect. “The biggest problem of China’s school bus industry is not the lack of a standard, but the rampant use of illegal vehicles,” a prescient vehicle-rental businessman from Beijing, Zhang Jie, told China Daily, a state-run English-language newspaper, at the time. Without enforcement, he said, new standards would represent “just a piece of paper” and data recorders expensive decorations. Five months later, 14 students died when a three-wheel farm truck being used as a school bus tumbled into a river in Hunan Province. And in September, police officers in Hebei Province stopped an eight-seat van in Qian’an with 64 preschoolers stuffed inside. “The government should not wait for more fatal crashes to occur to take whatever steps are needed to ensure that the nation’s children are as safe as they can be,” China Daily stated then. The Gansu tragedy prompted Chinese Premier Wen Jiabao to promise more government funds to provide improved school bus services. The school bus crashes also reflect the growing trend in rural China for schools to be concentrated in larger towns, abandoning villages where the population has been shrinking. Children then have to travel long distances to school or board away from their families. "Students became trapped at the bottom of the overturned bus and drowned as water gushed into the wreck," Xinhua reported, citing Zhang Bin, a deputy head of the Fengxian county, where the accident happened. The driver, he said, had been detained. Xinhua gave conflicting accounts on the number of children on board the bus, but all the reports suggested it was not overloaded. Xinhua last reported that 29 were on board. Two other accidents involving students were reported. A bus crash in Zhumadian city in central Henan province killed two students on Tuesday and injured 20 people, seven seriously, Xinhua reported. 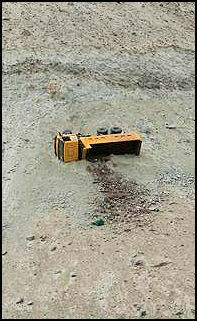 The bus had been rented by a middle school and was carrying 50 students and teachers when it rammed into a truck. A few days before a school bus carrying 59 children collided with a truck in Guangdong Province, in China's far south, injuring 37, media reported. The deaths and injuries are sure to amplify calls for more spending on education and children's safety. In 1993, the Chinese government vowed to dedicate 4 percent of GDP to education. "Close to 20 years have passed, and this has still not been achieved," said an editorial in the China Information News on Tuesday. "For some local governments, the proportion of GDP spent on education has actually fallen." Chinese microbloggers were quick to express their anger about the Jiangsu crash. "Another school bus accident kills 15 children. It's just a number in the eyes of Chinese officials. The only thing they care about is whether it impacts their future career," wrote Huiji Flying on the Twitter-like Sina Weibo microblog. "Nothing is safe in China apart from leaders' cars, houses, money and concubines," added Yiran Anki. bus accident in Hong Kong In July 1997, two overloaded tour buses on their way to Emei Mountain plunged off a mountain road into the Yangtze River, killing 43 people. Around the same time 14 people died when an overloaded bus, with people sleeping in the floor, went off the road and plunged into a river in southern China. In January 2002, 17 people were killed when a mini bus packed with schoolchildren plunged 70 meters off a mountain road into a river in Yunnan province. The same year, 34 people died when a long distance bus traveling from Urumqi to Kashgar. plunged off a bridge in Xinjiang. In September 2003, a bus swerving to avoid an oil truck near Ya’an in the northern province of Shaanxi went off the road and plunged into a ravine, killing 27 people. In May 2004, 22 people were killed when a bus plunged over cliff near Wanyuan, a city in Sichuan Province. In June 2004, a farm trucked packed with migrants workers crashed into guardrail near the city of Jiangjin in the Chongqing region, killing 16 people. In September 30 passengers were missing after a bus was swept off a bridge by a swollen river on the outskirts of Chongqing. In November 2004, 23 people were killed and another 46 were injured after a bus plunged into a river in northwest Shaanxi Province. The bus, carrying 72 people, overturned before going into the river on a highway between Xian and Zhouzhi country. In August 2005, a bus veered onto a sidewalk in Shenzhen and killed 19 people. The bus had veered to avoid hitting a bicycle. The sidewalk was crowded with people heading home from work. Overturned truck in Xinjiang In November 2005, a bus plunged off a snow-covered mountain road in southwestern China, killing 24 people and injuring 13. More than 200 rescue workers and residents took part in the rescue operation. In December, a bus ran off the road in northern China into a freezing section the Yellow River, leaving 28 people missing and presumed dead, The accident occurred when an icy section of road near the river collapsed, causing the bus to fall into the river. In December 2006, a bus plunged off a cliff in southwestern China, killing 17 people. In February 2007, a tour bus with 41 people traveling in the wrong lane on a highway in the city of Hecho in Guangxi Province in southern China collided with an oncoming bus, with 48 people, killing 13 passengers and injuring 75. In March 2007, a bus carrying 33 passengers plunged into a reservoir in Shanxi Province, killing 22 people. In April, a bus plunged 20 meters off an overpass in Chongqing, killing 24 people. Rainy conditions and a slick road were blamed. In May 2007, 20 women were killed when a three-wheeled tractor overtured on a mountain road in northern Liaoning Province. The women were being transported in a cart attached to the tractor after a day of picking herbs. In July 2007, a bus plunged into a river while trying to drive on to ferry, killing nine people, in southeastern China. Many of those on the bus were schoolchildren on their way to camp. In August 2007, three Chinese were killed and 13 Japanese tourists were hurt when a tour bus with 21 Japanese tourists collided head-on with a car in Xian., The dead included two people in the car and a tour guide on the bus. The bus was on its way from the airport to the city center. The collision took place after the car crossed over the center-line into the opposite lane. In January 2008, a bus veered off a highway in Sichuan Province and plunged into a ravine, killing 14 people. In May 2008, three people were killed and 12 were hurt when a bus exploded in Shanghai. About 50 people were on the bus. Terrorism was ruled out. The deaths occurred because one of the doors jammed and the windows were locked shut because the bus was air conditioned. The fires after the explosion burned so hot they melted the steel plates at the top and bottom of the bus. In May 2008, nine people were killed and 20 others, including three Japanese tourists, were injured when a bus plunged into a nine-meter deep ravine in Huangshan City in Anhui Province. In June 2008, 22 people died in a collision between a bus and a truck in Shanxi Province in northen China. 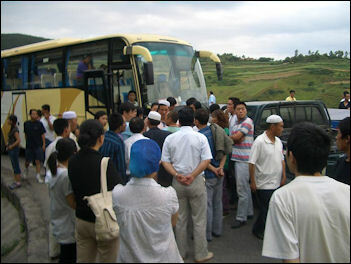 In August 2008, 24 people were killed and 20 others were injured when a bus overturned in Xinjiang in northwest China. The accident occurred on a remote mountain road to the city of Artux, most of the victims were Han Chinese high school students and members of the Kyrgyz minority. In September 2008, 51 people were killed when a bus plunged into a 100-meter valley in Sichuan Province. In November 2008, 18 people were killed and 29 injured when a passenger bus flipped over on a mountainous road in Tibet, The bus was carrying 47 people when the accident occurred in sparsely populated Su County. In December 2008, 20 people were killed and 12 were injured when a coal truck collided with a bus in Kuqa in Xinjiang in far western China. The bus was carrying 29 people when the accident occurred. 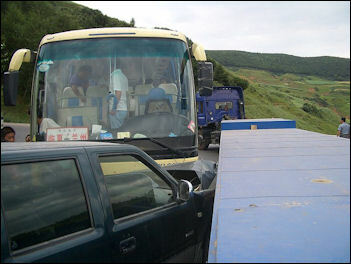 In April 2009, a tourist bus collided with a truck in Yunnan Province, killing 20 people. 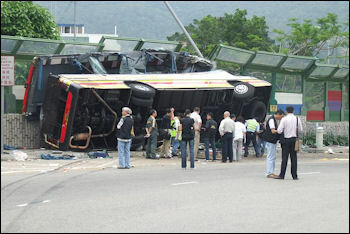 The accidents in the early morning when the truck smashed into the bus so hard the bus flipped over. In October 2009, an overloaded bus overturned in Hunan Province, killing 17 and injuring 54. The bus was designed to carry 31 people but was carrying 71 at the time if the accident. The extra weight and brake failure caused the bus to overturn going down a hill. In March 2011, at least three people died and up to 80 were injured when a bus driver in the northwestern region of Xinjiang lost control of the vehicle and collided with a passing passenger train. The bus, which was carrying mostly students on their way to school, broke through a protective fence next to railway tracks in Xinjiang's capital Urumqi and hit the train. In February 2011, 12 people were killed when a minibus toppled into a reservoir in the southeastern province of Fujian, after the driver apparently swerved to avoid a motorbike. Photos of the tragedy showed the bus had been completely destroyed by the blaze, leaving only a burnt-out shell. Five passengers and the driver were pulled alive from the overnight bus, which was reportedly only designed to carry 35 passengers but had 47 people on board. CCTV said there were "flammable materials" on board, but did not provide further details. A police officer told Xinhua the fire raged for two hours and completely destroyed the bodies of the victims, who would only be identified after authorities carried out DNA tests on the charred corpses.